Regular bread can get boring, so I used whole wheat tortillas to make a wrap with turkey, provolone, lettuce and a little Caesar dressing. Some roasted red pepper hummus is a healthy dip for wheat crackers. Fresh fruits and veggies round out the meal, all packed in an Easy Lunchbox. Take a break from lunchmeat with lots of finger foods! My girls like grape tomatoes, cucumber slices, wheat crackers with hummus, and a cheese stick. A hard-boiled egg adds more protein, and a Whole Wheat Pumpkin Chocolate Chip Muffin adds some sweetness with fiber. Get more ideas for Alternatives to Lunchmeat. This is a typical end-of-the-week lunch, a Taco Salad made from leftover salad and beans from other meals during the week. I added some crushed tortilla chips for crunch, a little shredded cheese and a side of ranch dressing. 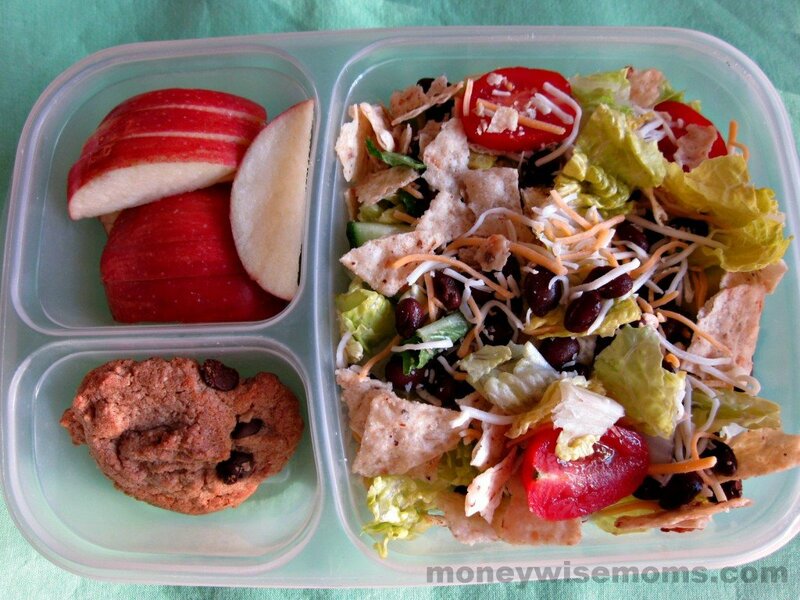 Along with an apple and a fiber-filled Healthier Chocolate Chip Cookie, it’s a great lunch! I pack healthy school lunches every day in Easy Lunchboxes, and those little containers are their newest product, the Mini Dippers. They fit perfectly inside the container and have their own lids–great for dips, dressings, and salsa. 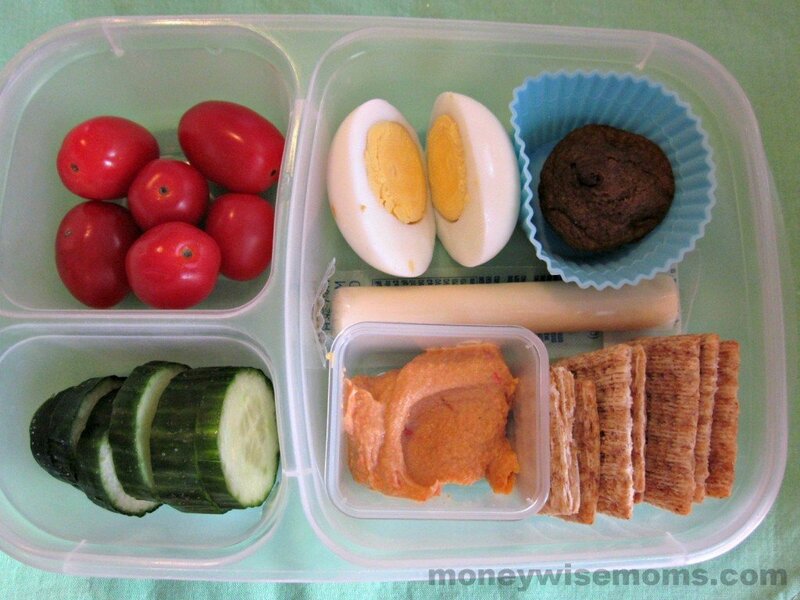 What are your kids’ favorite healthy school lunches? I have to say I love your lunch ideas and they would so work for me in particular, but I have two boys (14 and 8) and I could not get away with this quantity of food. In their minds it would be considered neglect!! And while I’ve always given and encouraged fruit and vegetables – just a small salad, apple slices, and ONE cookie would not fly – I think it’s a gender difference in food expectations – “where’s the meat Mom? !” would be their question. Do you have any ideas, taking what I’ve said above into consideration, for big boys? You have little girls, right? And kind of off topic here… I read about your experience with “Financial Peace” and decided to give the class a try. I have one week to go and have really found it helpful. 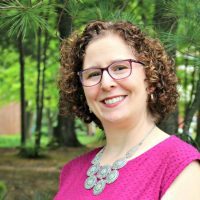 Thanks for sharing this resource – it has really given me some great tools! I hear you, Sue! My son is 9 and that salad is his lunch. He eats a good breakfast in the morning (bean & cheese burrito) and then a ton when he gets home from school. Right now this is working, but I imagine as his appetite increases I’ll need to pack even more food. I only do meatless 1-2 days a week, and it’s often a very filling meal like black beans & rice with shredded cheese in a Thermos, plus a whole container worth of other food on the side. I just try to make sure he has enough protein to get him through till he’s home again. I love these ideas! But getting my kids to actually eat them is another story. I send in their lunch boxes either leftovers from dinner the night before or some kind of sandwich, fruit, a snack and juice. Almost always they come home with the fruit. And sometimes the whole sandwich! I’ve tried mixing it up but they still bring it home. I have at least made it a rule that they have to eat it when they get home from school or else no other snacks. All that to say that I am completely jealous that your kids eat so great. I always prepare my kids’ school lunch everyday. I am not sure what they would eat if I let them buy their food at school canteen. 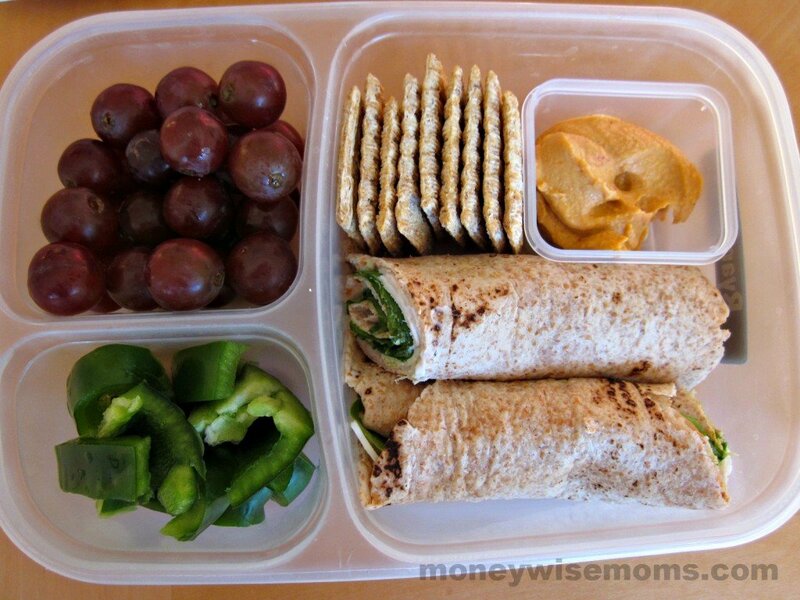 Their normal packed lunch consists of fruit juice, water, a serving of veggies, meat, a cup of rice, and any fruit available.